Waltzing Matilda: The feast of my favorite Capuchin! The feast of my favorite Capuchin! Coloring one of these, again. Making Cappucino Mousse, again. This time with some strawberries! Yum! So weird. 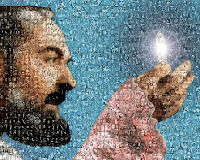 A Padre Pio prayer card showed up randomly on my desk this morning - how, I have no idea- and I prayed the prayer on the back before giving it to the baby. I didn't even know it was his feast day though yeah, right there on the front - September 23rd.